Are you stuck? The best way to get unstuck and grow your business is to talk to clients and customers. Today, I am talking to Chuck Hattemer, co-founder and CMO of Onerent, about systems and processes used to scale to 2,000 doors. While in college, Chuck had a horrible housing experience as a renter. An aspect that drew Chuck into real estate was that he could impact some of the most sensitive parts of people’s lives as renters. [03:06] Chuck describes his company’s first platform, which was student housing with a few extra bells and whistles. [03:26] Onerent took that as a model to investors to raise seed capital. [04:14] Onerent pivoted to a full-service property management. Eventually, it scaled to managing 2,000 doors. [04:54] Having come from the renter’s perspective and a lack of experience, Chuck is still naive about some things. But that naivate lets him think out of the box for solutions. [05:20] Onerent identified problems people were facing, how to make the experience consistent, and how value translates to the investor. [07:33] The current trend is putting money into other things instead of buying a property. So, people, especially millennials, are renting. [07:50] Chuck expects a big move eventually by first-time investors that is fueled by technology. [08:25] Onerent hired staff new to the industry and with a different perspective to drive the company’s culture and mission regarding how to interact with renters and owners. [09:48] At Onerent, it is ok to fail and apply what you learned in the next initiative. It’s a sign that you are making progress toward being successful. [10:49] Create a culture where staff feels safe and comfortable to express problems. Support your team, and they will support you as an entrepreneur. [12:33] At Onerent, each part of the rental process is managed by its own team. This helps handle tasks and keeps tenants informed. This collaboration drives motivation, happiness, competition,and success. [14:59] Onerent follows a workflow business model where staff members specialize in one area. [15:55] Make changes. Onerent would not be where it is today and able to scale its business without having pivoted from software to full-service property management. [17:00] Onerent figured out how to grow its business – talk to customers and clients to identify its next move. [17:48] Companies often try to sell what they can sell instead of what their customers actually need. [18:15] Don’t change everything at the same time. Make iterative changes over time. [19:27] To grow your business, determine the scale. What’s the purpose of your property management business? What is your key output metric? What is the closest tie to revenue and customer satisfaction? [21:20] What are the inputs that go into that output? Consider the customer lifecycle. Determine where you will have the greatest impact to improve efficiency and operations. [22:40] Unlock growth by having a sales team and defined sales process. Develop credibility by aligning and partnering with large real estate brokerages. [24:15] Onerent’s key performance indicator is its time to lease. Chuck has to deal with various constraints, including listing exposure; qualified applications; and signed leases. [25:24] Utilize on-demand scheduling for showings. Onerent then dispatches a mobile manager who shows a property. [25:45] People usually have to pay application and documentation fees. However, Onerent offers a free application process. [27:10] How do you start a property at the right price? Educate property owners that if they list the property too high initially, their listing stays on the market too long. [28:35] In property management, how can you look at things with fresh eyes? Get out of your office and talk to customers. Make sure to have an open mind about all problems. [29:30] Think about your own problems as a property owner. The best way to start a new business is to solve your own problems. [30:30] Entrepreneurs love to solve problems. If you could solve a problem, what would it look like? Unpack a problem into small components. Don’t try to solve it all at once. If you could solve a problem, what would it look like? Be open to feedback. Companies sell what they can instead of what their customers actually need. Create a culture where the staff feels safe to express when they are stuck. Today, I’m hanging out with Chuck Hattemer of Onerent. Chuck, welcome to the show! Chuck: Thank you so much for having me here. I’m really excited to be part of the show today. Jason: Fantastic. Chuck, you must have a really interesting story. You look like a pretty young dude, you’ve got this really thriving business that people are dreaming of. 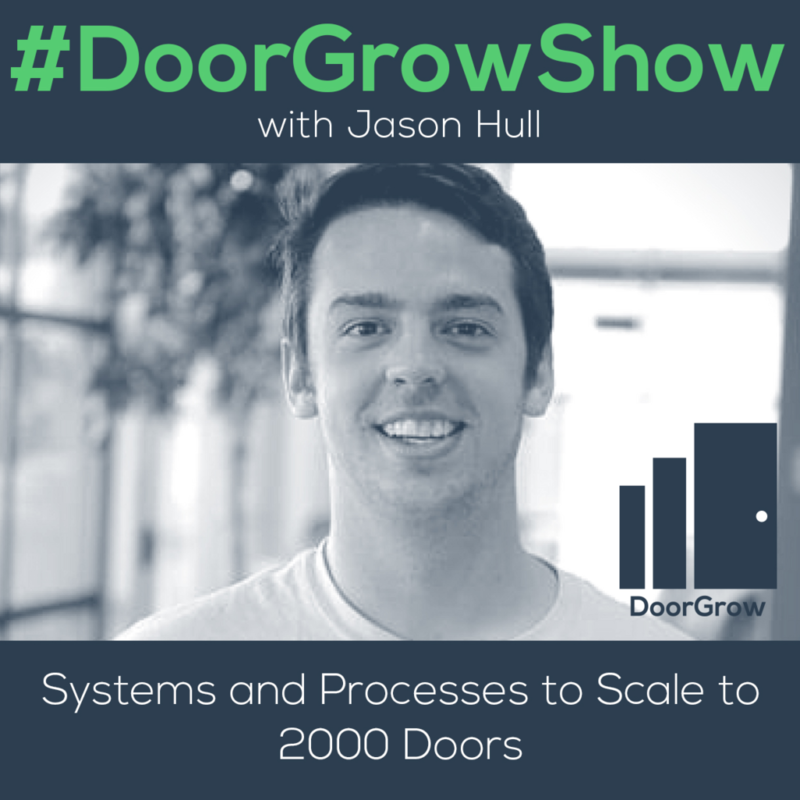 Today we’re talking about maybe some of the systems and processes to scale to your site like 2000 doors. I want to start with your story. Share a little bit of background about how you got into property management, and how Onerent came to be. Chuck: Sure. My co-founders and I here at Onerent, we were students here in California at Santa Clara University. We had this just awful housing experience as renters. It felt like the hunger games. Everyone was talking about which house they wanted to get, they are renting them a year in advance, people were lining up outside of the property manager’s offices with checks to try and save their spot. If anyone here manages student housing, it’s really just a huge pain for the student. We really started with just a pure platform, we were into technology prior to property management real estate. I myself was running a web design business with the family. I’d also been involved in film production, funny enough, completely unrelated. What I loved and what drew me to real estate was this concept that you could actually impact some of the most sensitive parts of people’s livelihood, whether it’s their investment as the owner or whether it’s their home as a renter. That really spoke to me and I saw a huge potential impact that you could have from a technologist perspective, given just how stagnated the industry has become in terms of growth and technology adoption. We started with our first platform. It was just a student housing listing platform with a few extra bells and whistles. We worked with the local property managers and we brought on about 90% of the inventory, we bootstrapped our initial business, we got about 96% of the inventory around the market onto our platform processed over $3 million in rent. Then we took that as a model to a group of investors here in Silicon Valley, the typical startup story, but we raised some seed capital. At that point, we had raised teeth capital, we had this proven model but the college housing season was over. What we thought is, the only way we’re going to be able to expand is really wait until the next college rental cycle. We took a hard look at what that model was and saw a lot of problems with it. First of all, there’s hundreds of platforms and utility platforms out there today. We did notice some of the local property managers, there wasn’t a huge interest from them to pay for our service and also every single property manager wanted a customized solution. We pivoted to full service property management about the end of 2015. In the beginning of 2016, we started with our beta group of customers, and we scaled that since now over 2000 doors leased managed. That’s our background story and the pivot we went through to get to where we are now. Jason: Awesome! That’s such a different start in several ways. One, coming from the renter’s side first and having that perspective. Most people start the property management business from the side of the investor first and they’re looking at it through that filter. How’s that perspective different for you? How do you think that helped you guys do things differently? What advantage is that? Chuck: Coming from the renter’s perspective and also coming into the industry without a lot of experience, we were and we still are in many ways naïve about many different things. In almost is that naivety that allows us to think of new solutions and think of things out of the box that there may already be a system or process design to accomplish this goal but we’re looking at things from a very fresh perspective, from a technology perspective. Coming from the renter’s side, what really made us understand the impact we could have in property management was that if you just talked to renters, renters hate their landlords more than they hate their tax accounts. Landlords and property managers have this reputation in the industry among renters and by focusing on that first, we were able to peel back the onion on what are the true problems that people are facing, how can we make this experience more consistent, no matter what property you go to, and how does that value translate back to the value for the investor in terms of reduced cost, reduced vacancy, better tenants, all that. Just being open to all the problems and not just saying, oh, that’s just the way it is, because I’ve been doing this for 25 years. But being open to all the problems and say, okay, these are all problems, what are going to have the most impact, that is where you can really grow the brand. For every one property owner interact with, we deal with 10 different renters. The volume, and the impact, and the potential reach of your brand and of your service through consumers and through renters has a much higher reach. Jason: We’re renting right now in California. Rent’s pretty high where we’re at. We picked the company based on obviously researching the management companies. Because I know management companies always like, I want to make sure we’re with somebody that’s really good if we’re going to be here and figure if we wanna set down roots in this area. Everybody said, “Use this company, not this one.” Because there were two major players in the market. My sister in law’s renting and she’s like, “We were with this other company and this new company is way better.” The reviews online showed the same story. It was pretty obvious, we’re only going to look at rentals in this company’s portfolio for vacancy, not these guys. We had the experience directly with the homeowner and that was terrible because maintenance was like nothing was getting dealt with. I’m one of the few crazy people in the real estate industry that enjoys renting because I want to lower my personal pressure and noise, I don’t want to be dealing with coordinating all the vendors that are facilitating this machine running that I call my household. Chuck: That’s the trend with people my age, the millennial generation, we’re putting our money into other things. We’re investing in Bitcoin and Etherium, we’re not investing in real estate. The demand is only growing among this generation in terms of home ownership. I do think that what’ll be interesting is as we grow up and get to the point where we can actually start deploying capital in real estate, I think there will be a big move of these first time investors. That’s futile in a large part my technology, unlocking that information that makes it okay to make a decision to buy a home even though you’re not going to go out there and visit it. I really think the renters are not only the largest reach that we have but they’re also potentially future customers for us. Jason: Yeah. You could convert them into customers. I love what you were saying earlier is that you saw that this was a way of impacting lives. How’s that driven your culture and your mission from the beginning, recognizing that this is a way of impacting lives? Chuck: We tried bringing on a lot of very experienced property management professionals and there are some really, really top notch people in our markets and we had the opportunity to work with them in the past. What we found with bringing on a lot of big property management professionals with lots of experiences, there is predetermined set of expectations or rules around property management in terms of how you interact with tenants and how you interact with owners. Every tenant wants all their deposit back. Screw all tenants mentality. All these owners are always knocking down my door. Don’t get me wrong! There are very frustrating situations like that and it’s good to vent at those times. It’s great that you built a community, Jason, where people can find help for those challenges. For us, that was really an important decision was actually getting fresh talent in the company. People that could see this from entirely new perspective. Through the execution and hustle, they are able to learn and develop the knowledge and develop some bruises along the way of how property management worked but a key part of our culture is it’s okay to fail and failing fast and you’re applying your learnings into the next initiative then that is a sign that you’re making progress towards being successful. Keeping that culture really rich and really just focusing on executing and being okay with letting people fail, that’s a huge part of our culture and something that’s really core among all the teams here. Jason: That’s a big deal to me. I tell everybody that I bring on my team that I want you to feel very safe to make decisions, very safe to make mistakes. I think if we built a culture around where anybody sees, because as entrepreneurs sometimes we’re a bit strong willed, we’re a bit strong in our way of doing things, sometimes we’re a bit strong in our presentation. Lot of times we walk in the room and it feels like we’ve just dropped a grenade and then we walk out. We think we just shared something amazing. Here is this great idea, and everybody is like oh no. I see my job and my role as CEO or as entrepreneur to support my team. Their role is to help support me and my dreams and visions. It’s a mutually symbiotic relationship but it’s so common to see, when business are struggling, to see the entrepreneur blaming their team and coming down on their team and it just creates a culture of fear, it creates a culture in which they feel like they can’t fail or make mistakes. They start hiding stuff. Then weird things start happening, like embezzlement, or secrets, or internal politics gets really crazy, and there is this culture of gossip and fear. I really resonate with the idea of impacting lives. I see that there’s this massive potential for property managers to create this ripple effect throughout the US and beyond and impact millions of lives, and I see my role as helping do that through my clients. If I’m able to get my clients in a space where they’re creating this positive impact, that ripple effect is exponential. Chuck: Yeah. We’ve set up our internal team into dedicated lines of business and dedicated team. Each part of the rental process is managed by its own team and this is pretty different from traditional management where the same person who you called a sign up for a property manager is also the person who’s screening the tenants, of showing the property. There’s over 200,000 property managers in the US. 50% of the revenue of a property manager is spent on just labor alone and it’s not necessarily looked at something that is a huge money maker. It’s usually an input into your brokerage business or your sales business. There has been stagnation of development in the internal team structure and company organization. Of course, there are some pros to that, you get a dedicated single point of contact, someone you can hold accountable from beginning to end. But when we talk to our customers, when we ask them, “What is really important about that single line of contact?” What really matters at the end of the day? Is it actually having a single point of contact? The reality is it’s actually getting the job job done well and keeping them updated. That’s what matters. There’s multiple people behind the scenes taking care of that. As long as that’s done, the customer is happy. That’s what our customers tell us. Part of our great internal team is that we have these dedicated teams for maintenance, leasing, sales, inbound customer support, customer success, and accounting. Each team has its own group and we build the technology that connects these teams together and it also create a great collaborative environment. Because as everyone knows, in property management, everything is connected. When a maintenance bill comes in, accounting gets involved, customer success needs to get involved because the tenant may be unhappy, the owner may be unhappy. Those kind of things are really important and if you celebrate those wins like you’re saying, sending out those weekly reports, celebrating the wins. One way we do it on Slack. Slack is an internal tool for our company for chat. Slack has very simple, easy use integration. If you have a team, especially a remote team, if you’re working with virtual assistants or folks off shore, you can get them on Slack, you can integrate to that, you can celebrate wins as they come. It’s those small moments that really drive the team to not only be motivated and then happy, but also a little bit competitive with each other. It drives that success. Jason: You mentioned that you looked at some of the typical business models in property management. The two typical business models are portfolio style or departmental. It sounds like yours is a variation of departmental but it’s almost like maybe a new one, maybe like workflow, workflow stage oriented team. Does this sound accurate? Chuck: Yeah. Exactly. Basically we cut off the realm of responsibility once it gets too far from the mean work. It’s definitely workflow organized like you said and really make sure people are specializing in one area. Jason: Another thing that you pointed out that I thought was interesting is you mentioned that initially, you were trying to do a completely different business. You were trying to create a software and then you decided to shift to doing property management and you had to pivot. How important have you seen making pivots and changes in the business be and is that something you see as a common thing in property management? Chuck: Absolutely, the pivots were instrumental. We wouldn’t be able to be where we are right now in terms of scale without some of the tough decisions and quick pivots we had to make. Part of it is the fact that we are a venture backed company, so we do have a certain responsibility to ourselves, to our employees, to our investors. We need to be scaling this business. The folks that invested in our company are not looking for a lifestyle business, they want a high growth operation, and we want that obviously, and we believe that that can be achieved and have this national brand for property management which has never existed before. Those pivots were super important. We’ve had to make some really tough ones in the past. For us, the software to service pivot was obvious. It literally started with the idea of Uber for property management, why doesn’t that exist. Because at the time when we were doing student housing platforms, we had two types of customers. We had property managers and individual investors and owners. The individual investors and owners would come to us and say, “Hey, the software is great but the real pain is in the operational component. The showings, the taking time out of my day to do showings, doing maintenance.” Willing to pay for that. At the end of the day when you get stuck and your business is not growing where you want it go, I always say one of the best ways to get unstuck is just talk to customers. Get out of the building, just start talking to them. You don’t need to think of an idea before you go talking to them, you could just have questions and that’ll lead you to where your next pivot’s going to be. Jason: I think that idea is just to be a customer centric company. If you’re client centric, that’s who pays you, that’s where you get the money, typically. If you’re client centric and that’s your focus, as opposed to what I see some companies do is they try to sell what they can sell instead of what their customers actually need. We pivoted as a company. We were trying to sell marketing at first, we found that customers couldn’t use marketing because they weren’t ready for it. How can we get them ready? So we built a process to take them through, to get them ready for marketing, to turn them into marketing clients. The side effect was it was so effective they didn’t need marketing anymore. Then we had to pivot again. Okay, we’ll make this even better and make this our core product and offering, and then we’ll shift into what’s the next step because it’s creating this new problem where growth is no longer their issue, it’s how do I deal with growth. Now we’re adding new layers and new levels of product and services beyond that and we’ve shifted largely away from being a marketing agency doing the typical stuff. We’re getting into maybe BDM placements, lots of trainings, totally different direction. But it’s what people need. Chuck: I’m sure it wasn’t something that you just changed everything all at once. You made these iterative changes overtime and that’s super important to keep in mind especially in property management because it’s such a vast scope of services and features that you’re trying to offer to people. We are not perfect or we haven’t full unlocked that perfect client centric. But we have a vision of what we think that looks like in the future. We’re really committed to building that out. We are looking for it to be a hyper growth thing, this is not something that is feeding a sales business for us, we have no brokerage business, we’re pure property management. Jason: Let’s talk about how can people that are much smaller, they’re maybe trying to grow their business, what could they do to be a little bit more like Onerent. You’re not all over the planet yet, competing with everybody yet, so maybe you could help some other guys out. What could they do to have similar sort of success that you think that maybe they’re not doing? Chuck: I think the first thing you have to ask yourself, what scale do you want to get to? What is the purpose of your property management business? If it’s something that is feeding a sales brokerage, that’s fine, it matters how you think about that question to begin with. Typical property managers spend less than 2% of revenue on growth. There is a huge opportunity to increase that number but you’re going to have to take some dollars out somewhere. And that usually is in labor, that’s the biggest chunk, around 50%. If you are interested in rapidly scaling the business, the exercise that we’ve developed and built our growth model is really starting with what is your key output metric. For us, that key output metric is leased units, it’s monthly leased units, and key performance indicative of that is the time it takes to lease a property. The reason that those are our key metrics are number one, it’s the closest tied to revenue and customer satisfaction. If you can lease a property fast, then that probably means that the renter is happy because they got to move in quickly, the owner is happy because you reduced their vacancy cost. It also represents the efficiency of your operations. It’s a really great metric for us, monthly leased units. Kinda start to peel back the onion a little bit and we say, okay, that’s our output, what are all the inputs into that output? You take the customer life cycle and you think about everything from signing up new owners to the number of views on your listings to the number of inquiries on your listing, the number of showings scheduled, to the number of applications, all the way down to leases. You can take each one of those inputs and peel it back even further if you’d like. That exercise, if you do that and you chart this out and write it down into what we call a qualitative growth model, what you’ll be able to do is if you plug in numbers into all those things. In a month, we lease this number of units, we get this number of applications, number of showings, all the way up to the funnel, and you start to tweak those numbers, you can start to see where you’re going to have the greatest impact. You can really start to build out your initiatives. For example, if number of applications is a key metric to driving your output, then what you’ll say, this has the highest impact. If I changed these numbers on excel, that delivers the greatest impact to that monthly leased units. Maybe you make your applications free and you hit the cost because you know it will paid off. Maybe you figured out a way that you can automate more the application process or start earlier on during the showing process. Some of those exercises are really great to just start to build efficiencies and process in your operation. The other thing is there is an element of being departmental in terms of unlocking that growth. For us, we have a sales team, an inside sales team. We have sales development representatives who are doing both outbound and inbound demand generation and qualifying leads. They process around 3000 leads a month and then we have account executives who are closing those deals. We have a very defined insight sales process, that has been really key to our growth. The second thing is again developing that credibility. We developed a lot of partnerships in the business. We’ve aligned ourselves with some of the biggest real estate brokerages here in the Bay Area where we’re based out of but we also service up in Seattle, and down in San Diego. Partnering with real estate agents who bring that credibility for our business. Any client who may be interested about buying an investment property, now, instead of that real estate agent running away because they don’t want to touch property management, they can say yes to that client, and they could say hey Onerent is our partner for that. Some of those key initiatives have been really big for us in terms of unlocking that growth. Starting from an internal process point of view and identifying those inputs and where you’re going to have the highest impact, all the way to how you structure the internal organization. Jason: This is a very software nerdy way of doing it. I think your background in software helped you see and look at the business in this way. Software’s all about if, thens, and process, and whether things are working. You mentioned time to lease being your biggest key performance indicator to look at. Based on you experience, what are some of the most significant constraints that you’re dealing with there? Chuck: The inputs for time to lease if you think about that are going to be the top of funnel is going to be the exposure that you’re listings are getting, how many leads you’re getting, the inquiries. Middle of funnel is going to be showings, and applications, and then the bottom of funnel is going to be those lease assign and the qualified application. For us, the top of funnel is where we focus on first because that had the highest impact initially. Really trying to find unique ways that we can bring new exposure to a property and make it super easy for people to get to the next step which is scheduling showing. What we found, again, this is coming from the retro perspective gave us some unique ideas here, as renters, we were going to 10 different landlords, back and forth over email. You go on Craigslist you find 10 listing, 3 of those are probably expired or already rented, 2 of those are scams probably, you’re left with 5 listings and you’ve already spent all this time and you’re trying to schedule showing. That was the first thing. Making a super easy to schedule showings and making it on demand. For us a renter can schedule a showing seven days a week, eight hours every day, anytime, and we’ll essentially dispatch what we call mobile manager, which is like an Uber driver for Onerent, who will come out to the property, show it, and then provide feedback from the tenant. And then the next thing was application. That was the biggest constraint was people usually have to pay $30-$40 application fees, there’s document collection, if anyone’s collecting W2s, pay stubs, bank statements, take forever. What we did is we made the application free, and then we’ve plugged in with different software where you can scan your ID and autofill all your application, run the credit check, background check, eviction history check, income verification, all within a span of a couple hours. That was drastically […] than what we’re seeing in the market. If they respond A, we immediately reply with an application link which they could do on their phone. If they respond B, not interested, then we’ll ask them why and we’ll also send them a list of similar properties. And if they answered C, they say not sure, we ask them for that feedback and that feedback is actually direct to the owner. Those were some big initiatives, just small tweaks here and there. Right now, something that we’re really focused on is pricing. How do we start a property at the right price? Everyone in property management knows that there’s always a price for every property. I don’t rent eventually, it’s just a matter of how low your owner’s willing to go. What we’re doing now is really educating property owners. We’ve collected a ton of data in terms of leasing properties. We’ve run some data analysis around this and what we’ve identified is if someone lists their property too far above market, above the median market rent that we got from comps when we first started, if they list too far above initially, then they’re screwed and their listing is going to stand the market for far too long. If you rent it just a little bit above market, we actually do a pretty good job of getting people couple extra bucks there, but there’s that threshold when you go too far. That’s a big initiative right now. We’re really trying to arm our team with the right resources, right knowledge about the real estate market and what’s going on in our local communities in terms of the supply and demand in order to get better pricing. Jason: One of the advantages you had coming to the space is not being a property manager. I’ve seem that be a very competitive advantage for me, and the advantages that you’re coming with fresh eyes, you’re looking at it through a fresh filter, and you’re not just following the status quo in doing what everybody else does. How can property managers do that? They’ve been involved in NARPM, they’ve been around everybody else, they’ve heard all these everybody’s doing it this way, this is how it’s done. How can they escape that and look at things through fresh eyes? Chuck: My immediate reaction to that would be, again, get out of the building and talk to the customer and do so in a manner where you have a completely open mind to any of the problems and document all those problems that you’re hearing from the customers. Then you can organize them into what you want to tackle, what you don’t want to tackle. You have to go at a very open mind in order to keep yourself from saying, I know that’s a problem, but it’s always a problem in this industry. As soon as you started doing that, you stop being a pioneer. If you want to be a pioneer, talk to your customers with an open mind, ask them open ended questions to get feedback. If you have property yourself, think about your own problems as a property owner, think about how you can optimize there. But often times, the best way to start a new business is to solve your own problems first. Once you start doing that, you start feeling good about trying new things and really getting that momentum. Jason: I love to ask people, “What’s your biggest challenge with X?” Whatever that X is. What’s your biggest challenge with growing your property management business? What’s your biggest challenge with this? I always get really great feedback, they tell me what their biggest challenges, at least from their perspective. And then a great follow up question to ask yourself—because entrepreneurs, we love solving problems, we’re hardwired to do it. We hear a problem, we feel like solving. If I could solve this problem, what would that look like and just be open to those ideas? If I can help people grow without spending a ton of money on marketing, what would that look like? What would be the best way to do that? These are the questions that drove our seed package process, and helps us find some really innovative ideas. I think in business, ask yourself these open ended questions as well. Those that are listening, ask yourself, of I could solve this, or if we could eliminate this, even though everybody’s dealing with it, what would that maybe look like? What could we do there? Chuck: Take a big problem and you can break it down to smaller components and again, don’t try to solve everything at once, you’ll drive yourself crazy, I will never do it. I’ve seen some people post in the group, language that they’re editing within their contracts, even those are small meaningful changes that doesn’t take a ton of time. You could start with just a sentence that you jot down and you show it to customers and say, “What would you think if this was in the contract? Will that help you solve the problem?” And if enough people say yes, then you can go back to your lawyer and do all the rest of the work. But start with something small and scrappy. Jason: Yeah, absolutely. My last interview was with Tim France and he talked about this concept, he kept talking about unpacking it. You take whatever the problem is and then unpack it because there’s probably multiple levels to that. Maybe you can’t deal with one thing, maybe there’s something else you can take care of though. A lot of times, we group it altogether and think, oh, it’s this problem, and it’s unsolvable. But if we unpack it, there’s probably some elements to that problem that can be resolved or taken care of, or mitigated, or changed, and it reduces the size and the scale of that issue. Love that. Chuck, I really appreciate you coming out, spending all this time. How can people that are wanting to check you out and check out Onerent, how can they get a hold of you, or how can they learn about your business? What’s the best way? Chuck: One, connect with me on LinkedIn, what other property managers are doing all across the country, and would love to open up the conversation there and on the group as well, Jason, the DoorGrow group which has been really cool for us. Our team actually, if they’re feeling like they’re in a lonely spot in the road, they’ll go to that group and say, “Wow, there’s other people who are having these problems too.” It’s been a big moral support for our team. Our website is onerent.co, not .com, that’s an expensive domain but onerent.co, I’m on LinkedIn, I’ve also dabbled with Quora a little bit. Check me out there and shoot me a message or check out our website. Jason: Awesome! Great. Thanks so much, Chuck. And if you guys want to get in on the DoorGrow Club, it’s a free Facebook group, the engagement is absolutely insane. We got some of the savviest property management entrepreneurs on the planet in there. You can get to that just by going to doorgrowclub.com, it’ll redirect you right to the Facebook group, and we’d love to have you in there. Make sure you answer the questions or we won’t let you in. we’re really careful about who we let in. It’s only for property management business owners and entrepreneurs. If you are a principal or key person at the top of a property management company, then you’re the person that we will approve and let into the group. It is really positive momentum based. Chuck: It’s a shining light. It is a shining light. Jason: Cool. I appreciate you plugging my group. Reach out to Chuck. I really appreciate it. Looking forward to connecting with you more in the future. Chuck: Awesome. Thank you so much, Jason. Thank you, everyone.